Molten Aluminum Flow Box - AdTech Metallurgical Materials Co.,Ltd. a unitary dual nozzle assembly located in a bottom region of the lower inverted pyramidal-shaped section. a lower inverted pyramidal-shaped section housing a unitary dual nozzle assembly having a pair of nozzles, the unitary dual nozzle assembly positioned within a bottom region of the lower inverter pyramidal-shaped section, the unitary dual nozzle assembly constructed of a thermally conductive material and insulated from contact with the lower inverted pyramidal-shaped section, and in thermal contact with the molten metal contained within the molten metal holding and pouring box during pouring and non-pouring periods through the pair of nozzles; and a pair of stopper rods, the pair of stopper rods engaging the pair of nozzles for controlling the flow of the molten metal to be poured through each of the pair of nozzles. 3. The Molten Aluminum Flow Box according to claim 2, wherein the molten metal holding and pouring box comprises an outer structural supporting layer and at least one inner insulating material layer to maintain the temperature of the molten metal within the molten metal holding and pouring box. 4. 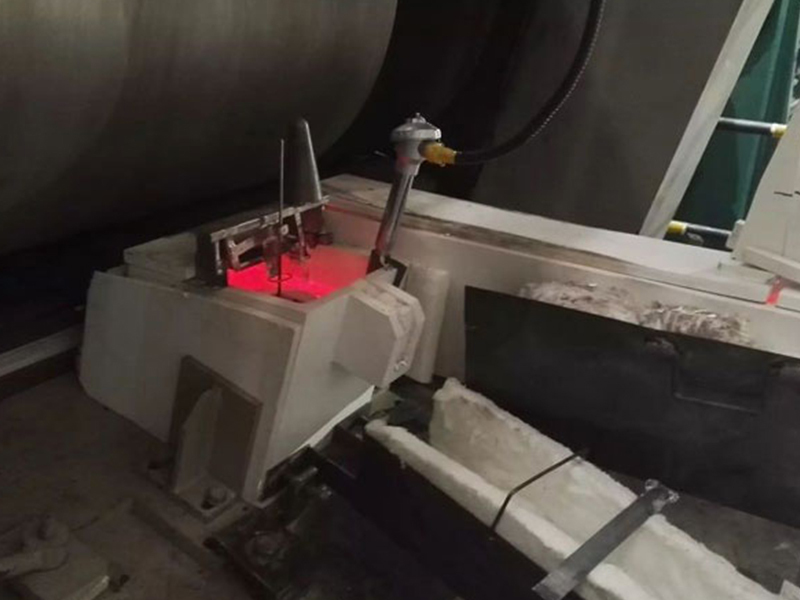 The Molten Aluminum Flow Box according to claim 2, wherein the unitary dual nozzle assembly is constructed of a material selected from the group consisting of alumina and silica. 5. The Molten Aluminum Flow Box according to claim 2, wherein each of the pair of nozzles has a conical funnel-shaped inlet and a nozzle insertion end of each of the pair of stopper rods is arranged so that when the nozzle insertion ends of the pair of stopper rods are inserted in the conical funnel-shaped inlet of the pair of nozzles to stop the flow of the molten metal through the pair of nozzles a portion of the conical funnel-shaped inlet in each of the pair of nozzles is in contact with the molten metal in the molten metal holding and pouring box. 6. The molten metal holding and pouring box according to claim 2 further comprising a unitary dual nozzle retention plate removably fastened to the bottom of the pyramidal-shaped lower section of the molten metal holding and pouring box around the outlet of each one of the pair of nozzles in the unitary dual nozzle assembly. 7. The molten metal holding and pouring box according to claim 6 wherein the unitary dual nozzle retention plate is removably fastened to the bottom of the pyramidal-shaped lower section of the molten metal holding and pouring box by a pair of retaining posts fastened to the bottom of the pyramidal-shaped lower section and a retention fitting passing through each one of the retaining posts below the unitary dual nozzle retention plate. 8. The molten metal holding and pouring box according to claim 7 wherein the unitary dual nozzle assembly is insulated from contact with the lower inverted pyramidal-shaped section by the combination of an insulating material surrounding the unitary dual nozzle assembly and an insulating standoff installed around each of the outlets of the pair of nozzles, the insulating standoffs disposed between the bottom of the unitary nozzle assembly and the upper side of the unitary dual nozzle retention plate. pouring the molten metal from the molten metal holding and pouring box through each of the pair of nozzles in the unitary dual nozzle assembly so that 75 percent of the molten metal contained in the molten metal holding and pouring box is poured into the pair of molds with no more than approximately 30 percent decrease in the rate of flow of the molten metal. installing the unitary dual nozzle assembly retention plate to the bottom of the new unitary dual nozzle assembly by inserting the pair of retaining fittings to the pair of retaining posts to hold the unitary dual nozzle assembly retention plate against the bottom of the new unitary dual nozzle assembly.